I’m reviving some old patterns that got swallowed by the internet abyss when I closed my old blog. 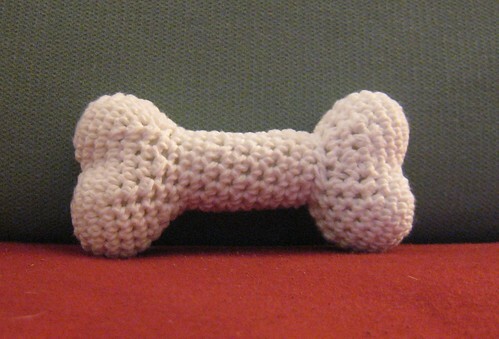 A few years ago, I made this wee crocheted doggie bone for my co-worker’s dog, Romeo. Here is the “recipe” since it is really just a teensy tiny modification of another pattern. Stuff both pieces and sew together! That’s it! Alternatively, you can crochet both halves for 5 rows after rnd 9, so the seam is in the middle. Your choice. 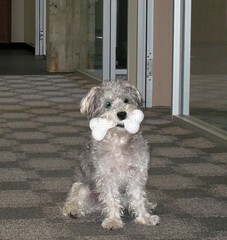 Romeo is a teeny timy dog, so he couldn’t chew through this thing. 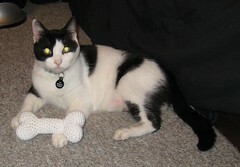 However, I would supervise larger dogs to ensure they can’t get to the polyfil inside. Thanks to much to Pepika for posting the original heart pattern.